This data set provides global estimates of carbon fluxes associate with annual crop net primary production (NPP) and harvested biomass, annual uptake and release by humans and livestock, and the total annual estimate of net carbon exchange (NCE) derived from these carbon fluxes. NCE estimates are for the combined crop plant harvest and consumption/expiration of fodder by livestock and of food by humans. Estimation of carbon uptake and release from global agricultural production and consumption required compilation and analysis of inventory data from various sources for the years 2005-2011. The flux estimates were spatially distributed to a global 0.05-degree resolution grid using MODIS land cover data. The quantities of carbon flux in each gridcell are represented in two ways: (1) where the quantities of carbon distributed to each gridcell were divided by the total gridcell area, resulting in average carbon fluxes per unit of total area (g C/m2/yr), and (2), where annual carbon fluxes associated with a source were summed over all types for the gridcell (Mg C/yr). The total surface area of the grid cells is provided. There are eight data files in netCDF format (.nc4) with this data set -- two files (per area and per gridcell) for each of the four flux source types. Data for all years are in each *.nc4 file. Figure 1. 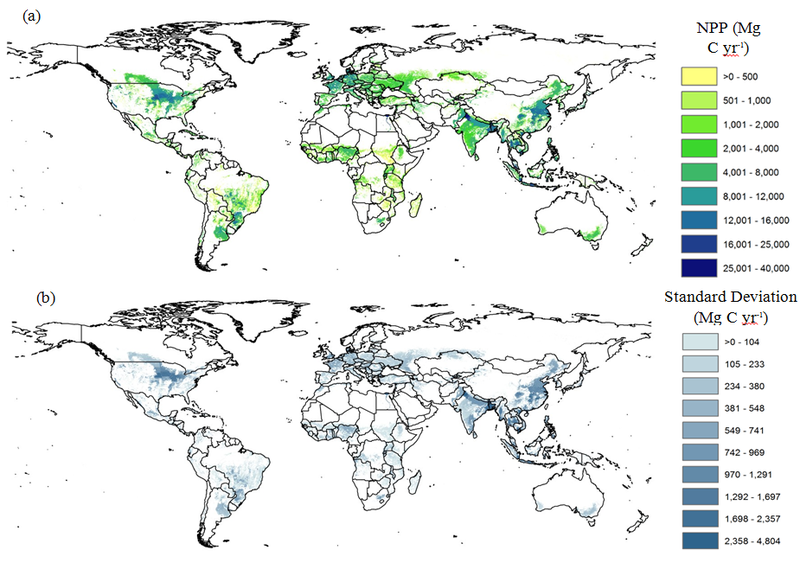 Net primary production (NPP) (a) and associated standard deviation (b) for global croplands in year 2009 at 0.05 degree resolution (Wolf et al., 2015). Wolf, J., T. O. West, Y. L. Le Page, G. P. Kyle, X. Zhang, G. J. Collatz, and M. L. Imhoff (2015), Biogenic carbon fluxes from global agricultural production and consumption, Global Biogeochem. Cycles, doi:10.1002/2015GB005119. Investigators: Wolf, J., T.O. West, Y. Le Page, G. Kyle, X. Zhang, G.J. Collatz, and M.L. Imhoff. The NASA Carbon Monitoring System (CMS) is designed to make significant contributions in characterizing, quantifying, understanding, and predicting the evolution of global carbon sources and sinks through improved monitoring of carbon stocks and fluxes. The NASA CMS will use the full range of NASA satellite observations and modeling/analysis capabilities to establish the accuracy, quantitative uncertainties, and utility of products for supporting national and international policy, regulatory, and management activities. CMS will maintain a global emphasis while providing finer scale regional information, utilizing space-based and surface-based data and will rapidly initiate generation and distribution of products both for user evaluation and to inform near-term policy development and planning. This data set provides estimates of carbon fluxes associated with annual crop net primary production (NPP), harvested biomass, and consumption of harvested biomass by humans and livestock. These estimates were combined for a single estimate of net carbon exchange (NCE)	and spatially distributed to 0.05-degree resolution using MODIS land cover data. Crop-specific carbon contents ranging from 0.41 to 0.63 were used for the harvested portion of the plant (e.g., grain, fruit, or other plant part) versus the stover and below-ground biomass, and crop biomass associated with harvest losses was included in estimates of crop NPP. The basis of these calculations was annual harvested biomass (Y) of 92 crops for years 1961-2011, which was compiled from FAOSTAT (FAO, 2013) for all reporting nations. A literature review was conducted to revise existing crop-specific dry matter fractional content (DMy), harvest index (HI), and root-to-shoot ratio (RS) for all included crops. Livestock carbon emissions were estimated based on annual livestock feed consumption, enteric fermentation, and manure management. Annual livestock populations of meat and milk-producing cattle, meat and milk-producing buffaloes, meat and egg-laying chickens, swine, sheep, turkeys, ducks, geese and guinea fowl, goats, horses, mules, asses, camels, and other camelids (i.e. llamas and alpacas) were compiled for years 1961-2011 from FAOSTAT (FAO, 2013). For purposes of tracking the use of all harvested crop carbon and estimating amounts of livestock forage, total livestock feed was disaggregated into fodder (i.e. biomass harvested by humans from croplands) and forage (i.e. biomass grazed or scavenged by livestock from non-cropland sources). Carbon consumed and expired by humans was quantified using data on total food supply, supply chain losses, and food intake. Food consumption surveys are available for a number of individual countries but global coverage is not available in a single report. Food supply, as opposed to food consumption, for all reporting nations is provided by FAOSTAT. Because of large gaps between per capita food supply and food survey reports of per capita food intake, FAOSTAT food supply data were modified to approximate reported food consumption. National per capita human food supply (FS) quantities by item, excluding fish, seafood, and orchard crop products, were compiled for years 1961 to 2011 from FAOSTAT (FAO, 2014a). Nations with reported human populations but missing food supply data were assigned per capita food supplies of a neighboring nation with similar climate and development status. Human respiration was estimated by multiplying intake carbon by the average ratio of respiration to intake carbon, 0.88, calculated from values reported by West et al. (2009). Total amounts of carbon in human food intake and respiration were summed at the national, regional, and global levels. To estimate carbon uptake and emissions at a subnational scale, crop carbon data was downscaled and spatially distributed to 0.05-degree resolution using the MODIS Land Cover Type 5, version 5.1 MCD12Q1 data product, following methods documented by West et al. (2014). Native 500-m MODIS data was initially gridded to 0.05-degree resolution, commensurate with the MODIS MCD12C1 product for climate modeling. Spatial distribution of human carbon fluxes was based on the 0.04-degree resolution Gridded Human Population of the World data set (SEDAC, 2005). The data cover the period 2005-01-01 to 2011-12-31. There are eight data files in netCDF format (.nc4) with this data set. The file names and general descriptions are provided in Table 1. The variables for each file and variable descriptions are provided in Table 2. All quantities of carbon distributed to each grid cell were divided by the total grid cell area, resulting in average carbon fluxes per unit of total area in files 1, 4, 6, and 8 (g C/m2/yr). 1. NCE_2005_2011_gCm2.nc4 g C/m2/yr Gridded annual net carbon exchange (NCE) associated with crop plant harvest and consumption of fodder by livestock in fodder and food by humans. All quantities of carbon distributed to each gridcell were divided by the total gridcell area, resulting in average carbon fluxes per unit of total area. 2. NCE_2005_2011_MgC.nc4 Mg C/yr Gridded annual net carbon exchange (NCE) associated with crop plant harvest and consumption of fodder by livestock in fodder and food by humans summed over each gridcell. 3. crop_2005_2011_gCm2.nc4 g C/m2/yr Gridded annual carbon fluxes associated with global crop plant net primary productivity (NPP) and harvest, summed over all crop types. All quantities of carbon distributed to each gridcell were divided by the total gridcell area, resulting in average carbon fluxes per unit of total area. 4. crop_2005_2011_MgC.nc4 Mg C/yr Gridded annual carbon fluxes associated with global crop plant net primary productivity (NPP) and harvest, summed over all crop types for each gridcell. 5. human_2005_2011_gC/m2.nc4 g C/m2/yr Gridded annual carbon fluxes associated with global human populations. All quantities of carbon distributed to each gridcell were divided by the total gridcell area, resulting in average carbon fluxes per unit of total area. 6. human_2005_2011_MgC.nc4 Mg C/yr Gridded annual carbon fluxes associated with global human populations summed for each gridcell. 7. lvstk_2005_2011_gCm2.nc4 g C/m2/yr Gridded annual carbon fluxes associated with global livestock, summed over all livestock types. All quantities of carbon distributed to each gridcell were divided by the total gridcell area, resulting in average carbon fluxes per unit of total area. respgCm2 g C/m2/yr Annual amount of carbon dioxide respired by humans distributed to the grid cell, in grams carbon / square meter. respMgC Mg C/yr Annual amount of carbon dioxide respired by humans that was distributed to the grid cell, in megagrams carbon. feedSDgCm2 g C/m2/yr The standard deviation of livestock feed intake distributed to the gridcell, in grams carbon / square meter. forageSDgCm2 g C/m2/yr Standard deviation of livestock forage distributed to the grid cell in grams carbon / square meter. CH4gCm2 g C/m2/yr Amount of livestock methane emissions distributed to the grid cell, in grams carbon / square meter. Methane emissions include manure management and enteric fermentation. CO2gCm2 g C/m2/yr Amount of livestock carbon dioxide emissions distributed to the grid cell, in grams carbon / square meter. Carbon dioxide emissions include those from manure management and respiration. CH4MgC Mg C/yr Amount of livestock methane emissions distributed to the grid cell, in megagrams carbon. Methane emissions include manure management and enteric fermentation. CO2MgC Mg C/yr Amount of livestock carbon dioxide emissions distributed to the grid cell, in megagrams carbon. Carbon dioxide emissions include those from manure management and respiration. The spatial distribution of these fluxes may be used for global carbon monitoring, estimation of regional uncertainty, and for use	as input to Earth system models. Through downscaling and spatial distribution of carbon uptake, release, and NCE associated with individual sources, net carbon fluxes at national and sub-national may be derived. The result of this effort is a spatially and methodologically consistent dataset of carbon uptake and release from global croplands (Wolf et al., 2015). Limitations: There is no incorporation of soil carbon in the global agricultural carbon budget. Estimation of carbon uptake and release from global agricultural production and consumption required compilation and analysis of inventory data. Inventory data refers to global, national, or subnational data that is collected through ground measurements, surveys, statistical estimation, or a combination thereof. The inventory data and application of these data to estimate carbon uptake and release are described below. Crop-specific carbon contents ranging from 0.41 to 0.63 were used for the harvested portion of the plant (e.g., grain, fruit, or other plant part) versus the stover and below-ground biomass, and crop biomass associated with harvest losses was included in estimates of crop NPP. The basis of these calculations was annual harvested biomass (Y) of 92 crops for years 1961-2011, which was compiled from FAOSTAT (FAO, 2013) for all reporting nations. Coconut, oil palm, date palm, banana, plantain, sugar cane, and cassava were included in the compilation, but crops produced by broadleaved trees were excluded. For ten large nations, state- or province-level major crop production data were compiled for available years between 2000 and 2011 (USDA, 2011, 2013; Statistics Canada, 2013), and the proportions of major crop production in each state were used to improve the spatial distribution of inventory data. A literature review was conducted to revise existing crop-specific dry matter fractional content (DMy), harvest index (HI), and root-to-shoot ratio (RS) for all included crops. A range of reported values of DMy, HI, and RS for ten major crops was recorded and used to estimate standard deviation around final estimates. The average carbon content of stover and roots has previously been assigned values of 0.40 or 0.42 (Johnson et al., 2006, 2014; Wilhelm et al., 2007) or has been incorporated into a whole-plant average value of 0.45 (Hicke and Lobell, 2004; Bolinder et al., 2007; West et al., 2011). In this effort, a value of 0.44 was used to represent the carbon content of stover and roots (CCcell) of all crops, based on reported carbon contents in roots and stover of rice, soy, wheat, maize, and sorghum, at maturity (McKendry, 2002; Abiven et al., 2005; Jensen et al., 2005; Amos and Walters, 2006; Roy et al., 2012). This value is similar to the molecular mass balance carbon content of cellulose. In contrast to stover and roots, harvested plant portions were assigned crop-specific carbon contents (CCy) derived from reported nutritional composition. Annual crop-specific harvested biomass Y was multiplied by the appropriate crop specific DMy to obtain the harvested dry weight (Ydw). Ydw was then converted to units of carbon (Yc) by multiplying by the crop-specific CCy. Total harvestable biomass (Hdw) is the sum of harvested yield Ydw and biomass contained in harvest losses (HL). Hdw was converted to units of carbon (Hc) by multiplying by the crop-specific CCy. Aboveground biomass in units of dry weight (AGBdw) was estimated from Hdw using crop specific HI. Aboveground biomass carbon is the sum of residue carbon and Yc. Belowground carbon was estimated by multiplying AGBdw by the crop-specific RS and by CCcell. Crop NPP carbon (NPPc) is the sum of total aboveground and belowground crop carbon. Total Yc and NPPc for all included crops were summed at the national, regional and global levels. Standard deviations of Yc and NPPc for each crop were calculated by developing a probability density function (PDF) for model parameters with multiple reported values (i.e. HI, RS, DMy, CCcell, and CCy) and then conducting a Monte Carlo analysis on the complete mathematical model used to calculate Yc and NPPc. The PDFs were developed by compiling a range of values through a literature review, including the mode and minimum and maximum likely values for each model parameter. PDFs were assumed to be normally distributed, and variability in coefficients assumed to be independent. Livestock carbon emissions were estimated based on annual livestock feed consumption, enteric fermentation, and manure management. Annual livestock populations of meat and milk-producing cattle, meat and milk-producing buffaloes, meat and egg-laying chickens, swine, sheep, turkeys, ducks, geese and guinea fowl, goats, horses, mules, asses, camels, and other camelids (i.e. llamas and alpacas) were compiled for years 1961-2011 from FAOSTAT (FAO, 2013). Annual producing populations of egg-laying chickens and milk-producing cattle and buffalo were subtracted from conspecific total populations to estimate populations raised for meat production. For ten large nations, subnational livestock population data reported by each nation were compiled for available years between 2000- 2011 (USDA, 2013; FAO, 2014b), and the proportions of national populations present in each state or province were used to improve the spatial distribution of inventory data. Accounting of livestock carbon fluxes was conducted similar to methods used by IPCC (2006), EPA (2010), and West et al. (2011). For purposes of tracking the use of all harvested crop carbon and estimating amounts of livestock forage, total livestock feed was disaggregated into fodder (i.e. biomass harvested by humans from croplands) and forage (i.e. biomass grazed or scavenged by livestock from non-cropland sources). Fodder was further subdivided into (i) market feed items derived from primary harvests (e.g., grains, brans, crop byproduct feeds), (ii) hay and fodder crops (e.g., harvested quantities of alfalfa, clovers, grasses, corn and sorghum silage), and (iii) crop residue feed, consisting of crop stover collected from the field for livestock feed. Annual national quantities of all market feed items available, including imports, are reported by FAOSTAT (FAO, 2014a). These quantities were converted into units of carbon, using fractional dry weight and carbon contents. Crop residue feed quantities were estimated by applying crop-specific regional percentages of residues collected for feed (Krausmann et al., 2008) to the crop- and country-specific estimates of annual residue production. Total annual fodder intake per nation (FDc) is the sum of market feeds, hay and fodder crop production, and crop residues collected for feed. At the national level, annual fodder intake was subtracted from total livestock feed to estimate the livestock forage intake (FGc), including grazing and scavenging. Carbon consumed and expired by humans was quantified using data on total food supply, food waste, and food intake. Food supply, as opposed to food consumption, for all reporting nations is provided by FAOSTAT. There are large gaps between per capita food supply and food survey reports of per capita food intake. Therefore, FAOSTAT food supply data were modified to approximate reported food consumption and food supply chain losses reported by Gustavsson et al. [2011, 2013]. National per capita human food supply (FS) quantities by item, excluding fish, seafood, and orchard crop products, were compiled for years 1961 to 2011 from FAOSTAT (FAO, 2014a). Nations with reported human populations but missing food supply data were assigned per capita food supplies of a neighboring nation with similar climate and development status. Food supply quantities were converted to units of carbon (FSc) by multiplying by item- specific fractional dry matter (DMfs) and carbon content (CCfs). Food supply chain losses were estimated to account for their contribution to the ultimate fate of carbon removed from the land. The total amount of carbon lost and wasted 263 from the food supply chain (FLc) was estimated by multiplying FSc by FL and AR. Total food intake carbon (FIc) per nation was estimated as the difference between FSc and FLc. Respiration (HCO2) was estimated by multiplying intake carbon by the average ratio of respiration to intake carbon, 0.88, calculated from values reported by West et al. (2009). Total amounts of carbon in human food intake and respiration (FIc and HCO2) were summed at the national, regional, and global levels. Standard deviations were calculated for FIc and HCO2. PDFs for food intake of 16 different groups of food commodities were developed from the mode and pooled standard deviation (Taylor, 1997) for each food group reported for 19 European countries by the Comprehensive European Food Consumption Database (European Food Safety Authority, 2014), assuming a normal distribution for each. PDFs for DMfs and CCfs were developed from a range of values within each food group. A Monte Carlo analysis was conducted for the full mathematical model. The resulting standard deviations for FIc of each food item in each nation and year were combined by summing in quadrature (Taylor, 1997). Spatial distribution of human carbon fluxes was based on the 0.04-degree resolution Gridded Human Population of the World data set (SEDAC, 2005). These data were initially reprocessed to 0.05-degree resolution for consistency with the land cover data. Food intake and respiration were distributed using the relative population densities. The estimate of cropland NCE follows methods developed by West et al. (2010), West et al. (2011), and Hayes et al. (2012) for North America. Carbon uptake by crops in the field is harvested, transported, consumed, and emitted back to the atmosphere. Gridded estimates of NCE are equal to the sum of carbon uptake and release that was previously distributed to each grid cell. All quantities of carbon distributed to each grid cell were divided by the total grid cell area, resulting in average carbon fluxes per unit of total area. If the release of carbon in situ is considered to occur within the same year the crop was planted, the sum of NPP uptake and carbon released through decomposition in situ is equal to the harvested and removed biomass. Gridded estimates of standard deviation per grid cell were developed from a quadrature summation of different carbon components within each grid cell, as previously discussed. Changes in soil carbon were not included in this analysis. Abiven, S., S. Recous, V. Reyes, and R. Oliver (2005), Mineralization of C and N from root, stem and leaf residues in soil and role of their biochemical quality, Biol. Fertil. Soils, 42(2), 119-128, doi:10.1007/s00374-005-0006-0. Amos, B., and D. T. Walters (2006), Maize Root Biomass and Net Rhizodeposited Carbon, Soil Sci. Soc. Am. J., 70(5), 1489, doi:10.2136/sssaj2005.0216. Bolinder, M. A., H. H. Janzen, E. G. Gregorich, D. A. Angers, and A. J. VandenBygaart (2007), An approach for estimating net primary productivity and annual carbon inputs to soil for common agricultural crops in Canada, Agric. Ecosyst. Environ., 118(1-4), 29-42, 555 doi:10.1016/j.agee.2006.05.013. EPA (2010), Inventory of U.S. Greenhouse Gas Emissions and Sinks: 1990-2008, Reports and Assessments, U.S. Environmental Protection Agency, Climate Change Division, Washington, D.C.
Gray, A. (2007), Report ID-341: Is biodiesel as attractive an economic alternative as ethanol?, Purdue University Extension, West Lafayette, IN. Gustavsson, J., C. Cederberg, U. Sonesson, and A. Emanuelsson (2013), The methodology of the FAO study: “global food losses and food waste - extent, causes, and prevention,” SIK (Swedish Institute for Food and Biotechnology), Goteborg, Sweden. Gustavsson, J., C. Cederberg, U. Sonesson, R. van Otterdik, and A. Meybeck (2011), Global food losses and food waste: extent, causes, and prevention, Food and Agriculture Organization, Rome. Hayes, D. J. et al. (2012), Reconciling estimates of the contemporary North American carbon balance among terrestrial biosphere models, atmospheric inversions, and a new approach for estimating net ecosystem exchange from inventory-based data, Glob. Change Biol., 18(4), 1282–1299, doi:10.1111/j.1365-2486.2011.02627.x. Hicke, J. A., and D. B. Lobell (2004), Spatiotemporal patterns of cropland area and net primary production in the central United States estimated from USDA agricultural information, Geophys. Res. Lett., 31(20), doi:10.1029/2004GL020927. IPCC: Intergovernmental Panel on Climate Change (2006), 2006 IPCC Guidelines for National Greenhouse Gas Inventories, Volume 4: Agriculture, Forestry and Other Land Use, Institute for Global Environmental Strategies, Kanagawa, Japan. Jensen, L. S., T. Salo, F. Palmason, T. A. Breland, T. M. Henriksen, B. Stenberg, A. Pedersen, C. Lundström, and M. Esala (2005), Influence of biochemical quality on C and N mineralisation from a broad variety of plant materials in soil, Plant Soil, 273(1-2), 307-634, doi:10.1007/s11104-004-8128-y. Johnson, J. M. F., J. M. Novak, G. E. Varvel, D. E. Stott, S. L. Osborne, D. L. Karlen, J. A. Lamb, J. Baker, and P. R. Adler (2014), Crop Residue Mass Needed to Maintain Soil Organic Carbon Levels: Can It Be Determined?, Bioenergy Res., 7(2), 481-490, doi:10.1007/s12155-013-9402-8. Johnson, J. M.-F., R. R. Allmaras, and D. C. Reicosky (2006), Estimating source carbon from crop residues, roots and rhizodeposits using the national grain-yield database, Agron. J., 98(3), 622-636, doi:10.2134/agronj2005.0179. Krausmann, F., K.-H. Erb, S. Gingrich, C. Lauk, and H. Haberl (2008), Global patterns of socioeconomic biomass flows in the year 2000: A comprehensive assessment of supply, consumption and constraints, Ecol. Econ., 65(3), 471-487, doi:10.1016/j.ecolecon.2007.07.012. Lamers, P. (2011), International biodiesel markets: developments in production and trade, UFOP-Schriften: German Union for the Promotion of Oils and Protein Plants, Berlin, Germany. McKendry, P. (2002), Energy production from biomass (Part 1): overview of biomass, Bioresour. Technol., 83(1), 37-46, doi:10.1016/S0960-8524(01)00118-3. Meyer, S., J. Schmidhuber, and J. Barreiro-Hurle (2012), ESA Working paper No. 12-08. Intra- industry trade in biofuels: how environmental legislation fuels resource use and GHG emissions, Food and Agriculture Organication of the United Nations, Agricultural Development Economics Division. OECD/IEA (2007), IEA Energy Technology Essentials Brief ETE02: Biofuel Production, Organisation for Economic Cooperation and Development/International Energy Agency. Perrin, R. K., N. F. Fretes, and J. P. Sesmero (2009), Efficiency in Midwest US corn ethanol plants: A plant survey, Energy Policy, 37(4), 1309-1316, doi:10.1016/j.enpol.2008.11.022. Roy, K. S., P. Bhattacharyya, S. Neogi, K. S. Rao, and T. K. Adhya (2012), Combined effect of elevated CO2 and temperature on dry matter production, net assimilation rate, C and N allocations in tropical rice (Oryza sativa L.), Field Crops Res., 139, 71-79, doi:10.1016/j.fcr.2012.10.011. SEDAC (2005), Gridded Population of the World (GPW), v3, NASA Socioeconomic Data and Applications Center (SEDAC), Palisades, NY. Taylor, J. R. (1997), An Introduction to Error Analysis: the Study of Uncertainties in Physical Measurements, 2nd Edition., University Science Books, Mill Valley, CA. USDA (2014b), Iowa Ethanol Corn and CO-Products Processing Values, Market News Service, St Joseph, MO. USDA (2014a), Feed Grains: Yearbook Tables, Econ. Res. Serv. Available from: http://www.ers.usda.gov/data-products/feed-grains-database/feed-grains-yearbook- tables.aspx (Accessed 5 August 2014). USDA (2011), Crop Explorer for Major Crop Regions, Foreign Agric. Serv. Available from: http://www.pecad.fas.usda.gov/cropexplorer/ (Accessed 1 January 2013) U.S. Department of Energy (2014), Global Ethanol Production: quantity of ethanol produced by country from 2007-2012, EERE Alternative Fuels Data Center, Washington, D.C.
West, T. O., G. Marland, N. Singh, B. L. Bhaduri, and A. B. Roddy (2009), The human carbon budget: an estimate of the spatial distribution of metabolic carbon consumption and release in the United States, Biogeochemistry, 94(1), 29–41, doi:10.1007/s10533-009-9306-z. West, T. O., Y. L. Page, M. Huang, J. Wolf, and A. M. Thomson (2014), Downscaling global land cover projections from an integrated assessment model for use in regional analyses: results and evaluation for the US from 2005 to 2095, Environ. Res. Lett., 9(6), 064004, doi:10.1088/1748-9326/9/6/064004. West, T. O., V. Bandaru, C. C. Brandt, A. E. Schuh, and S. M. Ogle (2011), Regional uptake and release of crop carbon in the United States, Biogeosciences, 8(8), 2037–2046, doi:10.5194/bg-8-2037-2011. Wilhelm, W. W., J. M. E. Johnson, D. L. Karlen, and D. T. Lightle (2007), Corn stover to sustain soil organic carbon further constrains Biomass supply, Agron. J., 99(6), 1665-1667, doi:10.2134/agronj2OO7.0150.